‘Having previously always worked for other people, we’ve really paid attention to all the things that used to niggle at us!’ says Stewart Payne, co-founder and manager of this ‘East-Meets-West London’ salon. Business partner, Ricky Lee Jones, co-founder and Master Stylist who trained at the likes of Trevor Sorbie and the nearby Taylor & Taylor, and the addition of a few ‘little wow factors’ borrowed from more exclusive establishments is what really sets this homely-feeling salon apart from its mid-range competitors. While some of London’s most expensive salons will charge you for a cup of tea (on top of an arm and a leg for highlights), here the extras are free. Elderflower bellinis and strawberry tarts were being served on our snoop and there’s lots of thoughtful touches, such as phone chargers and comfy chairs. Dip-dying with ammonia-free colour (£63) may be the most popular treatment among the Shoreditch set, but those with a more conservative taste needn’t be scared off. The cut and finish (from £47 women, £37 men) is as good as any. 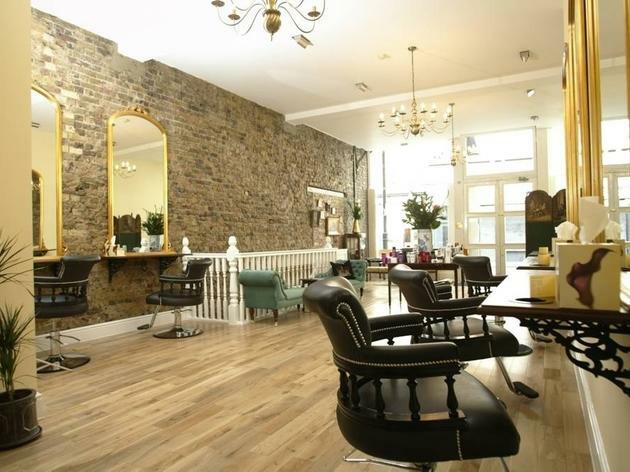 Stylish salon in the heart of Shoreditch or Covent garden. Experienced hair stylists for affordable prices! First time ive been to a proper salon to have my hair done in years... I saw there were mixed reviews but thought it couldnt be that bad so thought Id give it a shot. The more i look back on the experience the more I am annoyed at myself for not expressing my dissappontment at the time. I felt like I was an inconvenience and could blatently see my hair was being rushed so that they could get to their next client. What I was mostly disappointed with was being told my hair wasn't going to be blow dried properly because they didnt have the time. No sorry, no anything. I'm sorry but if im paying over 100£ i expect to come out with at least a proper blow dry... But instead it looked limp, flat, static, the color isnt as nice as id hoped and it does not look like id paid as much money as i did for it. Ill be honest i could have probably got it done for a lot less and have it look a lot better, with a much better service. I am usually not this critical but I feel the atmosphere in general was unwelcoming and that i wasnt a valued customer. More of a get in, get their money and get them out. I wont be going back. A massive thanks to Jack who cut my hair last Sunday. Definitely the best hairdresser I have tried so far in London! The salon is lovely too, real nice decor and lovely people working the reception etc. I'll definitely be back! I have a definite phobia of hair salons having never left one feeling happy or confident with the end result, however jones and Payne completely changed this for me. From the moment you walk In the salon perfectly combines the effortless style of a boutique hairdressers with the utmost professionalism and a truly relaxed atmosphere. The staff are extremely helpful and actually genuine they take in you as an individual and cater your hair to that individuality, unlike large salons such as tony and guy which feel like an almost factory process. I was looked after so well and truly felt like a v.i.p. The staff were a great mix of people and I felt completely comfortable with my colourist. The decor and five star treatment could justify extortionate prices but the salon is extremely reasonable and I came out of there feeling wonderful. I honestly cannot recommend this salon enough it is the perfect example of a passionate and experienced independent team who genuinely care about their customers a great salon! Great service, lovely hairdresser and was really happy with the cut! Sick of going to barbers and them f*cking it up. Found these guys on here and Simon did a smashing job. Few of my mates see him now as well. I had Chris, who was very pleasant, but didn't listen to what I wanted, which was a new hair style. "Something different" is what I said. That should be a stylist's cue to really style and offer new ideas. But I just ended up with a rather expensive trim. A few days later, my hair looked exactly the same as when I went in! Very disappointing. I visited Jones and Payne after moving to London - I needed to find a new hairdresser and having read the positive reviews abouts Jones & Payne, I gave them a go - the salon is lovely, the staff are extremely friendly and welcoming and I had a great cut by Claire who listened carefully to what I was looking for. Moved into the East end recently so after trying one salon close to where I live, which was a bit of a disaster a work colleague recommended Jones & Payne. Fantastic place, fantastic service, cool cut and I got 15% off as my friend recommended me! BONUS! Good first experience at Jones & Payne. Always a little nervous when trying out anything new, especially when my hair is involved, but I was made to feel very comfortable by my stylist (who's name slips my mind). The cut was very good, I only had a small snip so was never going to be groundbreaking, but he was very professional and I got tips on how to style at home, which was a nice touch I thought! Will definitely go back. Will not be going back. I wasn't consulted as to how I'd like my haircut, and what I did ask for I was not given. The hairdresser was uncommunicative, and although I was clearly unhappy they seemed unconcerned. Interestingly what attracted me to them was the overwhelmingly positive reviews on the internet for this salon, it's a pity the reality does not match what has been written about them. I was really impressed with Jones & Payne - had my haircut by Craig and he actually provided advice on what would work best on my hair rather than just asking me what he should do. I really value this insight from an expert and I'm really happy with the results. My only criticism was that the blow dry/styling at the end could have been better but I am a bit picky about that (and my hair isn't the most obedient!) so not too much of a problem. 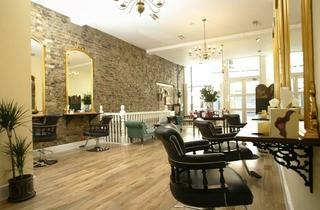 The salon has a really relaxed atmosphere and all the staff were really friendly. Prices about average for what you pay for a decent haircut in London. Will be going back. Really enjoyed my visit to Jones & Payne. I booked in for a half-head of highlights and cut with Claire (personally recommended) after not having my hair coloured for many years. She was really lovely and chatty and the colour is perfect. Really tight into the roots (my hair grows quite quickly so I'm fussy about this!). I'm also growing my hair for my upcoming wedding so begged her to only take the very necessary off the ends - which she did to perfection! Definitely going back when I need my colour re-done. I thought it was expensive - but that's probably just being out of touch with prices of highlights after so long instead of it being overpriced! Ditto to all of that. I've been having my hair cut by Ricky for four years - he and Stewart have worked incredibly hard over the last 18 months to keep standards as high as opening day. I wouldn't have my hair cut anywhere else! Have been to Jones & Payne twice now and have had a great experience both times. Charlotte did lovely and very natural looking highlights and Lewis is the only hairstylist who has ever made me love my curly hair! The stylists are personable and easy to talk to and the free cocktails are lovely. Highly recommended. Had such a lovely haircut experience on Saturday at Jones and Payne - cut by Ricky. Chilled environment, friendly relaxed staff, amazing head massage during wash. Oh and an awesome haircut too! Ricky really listened to what I thought I might be after (I didn't really know) and guided me to a style that really suits me. As a girl who rarely visits the same hairdresser twice, it means a lot when I say I'm definitely going back.